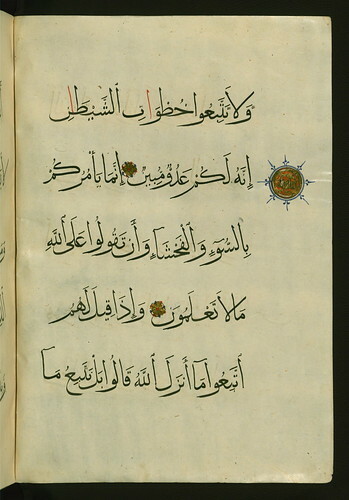 Illuminated Manuscript Koran, Walters Art Museum, Ms. W.561, fol. 12b, originally uploaded by Walters Art Museum Illuminated Manuscripts. A leaf from an elegantly calligraphed and illuminated large format codex of the Koran (Qur'an) made for the library of the Mamluk official Aytimish al-Bajāsī (d. 802 AH / 1400 CE). This manuscript, bound in the original beautifully decorated covers, represents volume two (al-juzʾ al-thānī) of a set of original 30 volumes and contains a portion of the 2nd chapter (sūrat al-Baqarah), verses 142-252.